The great thing about these collars is the hardware is recycleable, they’re cheap, easy and virtually disposable. If you totally trash one out in the field or on the trail you can cut the hardware off and use them again for a new collar. In fact, everything used to make the collar shown here was scrapped off something else. It just happened that they all matched perfectly. 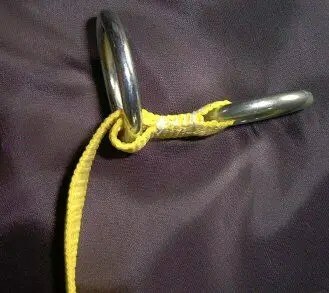 Sew the D-ring and female end of the buckle into one end of the web as shown. If you’re sewing with a machine align the foot with the piece of harware for a straight seam. Double or triple stitch. It needs to be really strong. Weave the web through the male end of the buckle and the slider as shown. Sew strongly. That’s all there is to it. 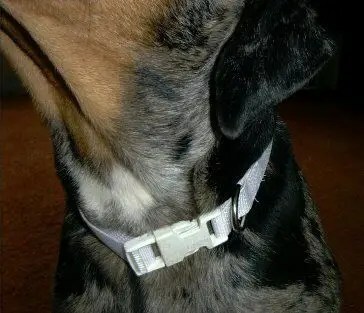 This is the most user friendly collar to make. This is a good collar for sled dogs or something with loose skin around its neck (ie hounds) as it snugs down to the neck, not the loose hair and such. A personal favorite as the big ring makes it easy to manipulate with cold or gloved fingers. Sew 1.5″ ring into end as shown. Wrap around 1″ ring and double back through 1.5″ ring as shown. Weave, as shown, through the 1″ ring and triglide slider. Voila! You’re done and have a nice new collar to boot! All text and images copyright 2001-2002 Amanda Tikkanen. No reproduction without permission. Submitted by Anonymous (not verified) on Sun, 2010-10-17 06:08. Submitted by Mandy (not verified) on Wed, 2010-07-14 03:03. 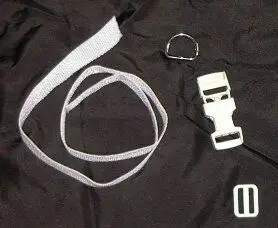 I found out for making the first dog collar that its best to use a contoured side release buckle as it isn’t so flat around the dog’s round neck. A “plastic keeper” is good too add to it as it makes the two parts of nylon webbing come together when its adjusted to the dogs neck size. 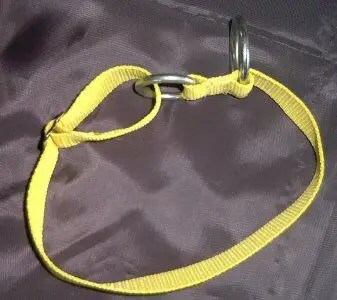 Metal double buckles are excellent to use for making a dog collar out of nylon webbing as well. you just need a d-ring and you have a stronger collar for a dog that pulls a lot. 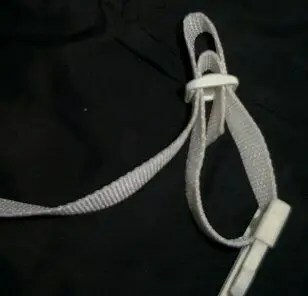 You just put a long piece of nylon webbing over the metal double buckle (you can search for them on a place like Ebay) and sew some of it together, then add the D-ring shortly after. The sew the rest of the nylon together so its doubled and stronger. 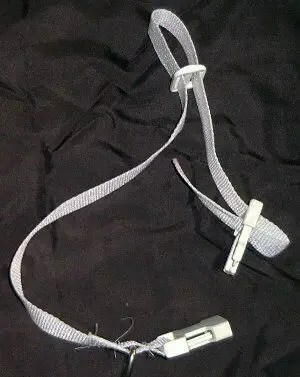 when its all sewn together, you make holes in the nylon webbing by heating up a large nail on the stove top at the highest temprature, use pliars to hold the nail when its hot and put the nail into the part of the collar where you want the holes to be, for making adjustments on the dog’s collar size. 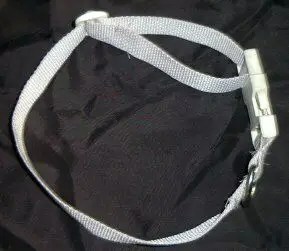 I often look for used dog leashes made from 1” nylon webbing at rummages sales and second hand stores to make into dog collars. 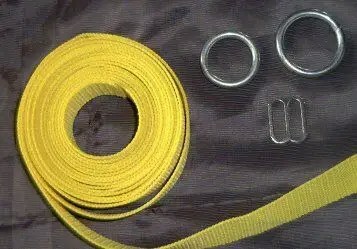 Although searching for 1” nylon dog heavy webbing on ebay, you can find it for sale in 10 yard rolls for much less than the price of a one leash at the store. 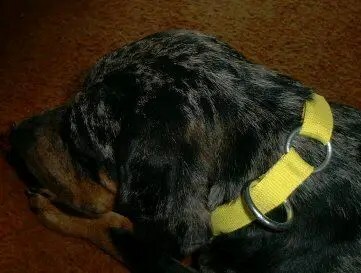 This link is great for finding supplies to make dog collars at home. You can sell the dog collars for cheaper than they are at the store to other pet owners, and they are just as good if not better than the store bought http://stores.ebay.com/Country-Brook-Design They dog sell 1” Double Bar Dog Collar Buckles but you can add that to the search bar on Ebay and you’ll find some for sale in bulk. Happy Collar Making!!! Submitted by S Braman (not verified) on Mon, 2009-02-09 02:32. Submitted by Kell (not verified) on Wed, 2008-09-10 21:11. Hi! We’ve never had standard issue dogs so finding collars has been difficult. Had a sharpei mix with sensitive skin so finding a collar that would fit (beaucoup dewlaps) and not irritate even more difficult. The sealed end of webbing on the d-ring end most collars is on the inside of the collar — this can be uncomfortable if not stitched down really well (shaved the hair off the dog’s neck). If you flip the seam to the outside of the collar the dog is much more comfortable. It can sometimes be done on commercial collars if the buckle isn’t curved to fit the neck — now I don’t have to waste time looking for a flippable end. Thanks! Submitted by Steph (not verified) on Mon, 2008-07-28 12:03. Great website! I have made a few leashes & have been wanting to try to make collars, harnesses, beds, booties… everything you have here! I’ve been searching for info like this, thanks for the great site & I can’t wait to try some stuff! Submitted by Kristin (not verified) on Fri, 2008-07-11 14:46. Submitted by Paulet (not verified) on Mon, 2008-05-26 14:46.